I didn’t say anything. I just waited. We drove in silence, both of us deep in thought. As we approached the house, I didn’t know what to expect. We rang the doorbell and were greeted by the sweetest woman imaginable. “Follow me,” she announced. The kittens are upstairs. “Don’t worry if the momma cat hisses at you. She is very protective of her babies,” she explained. But the momma didn’t hiss. Instead, she sat right on my lap and rubbed her face against mine, giving me a kiss. She immediately approved of us for one of her babies. There were five – three girls and two boys. One was cuter than the other. I sat on the floor and Marc sat on a chair. We both were instantly smitten. Every kitten that Marc picked up dozed on his lap. “Wow, you are like the cat whisperer,” the foster mom commented. Marc simply smiled. “This one,” I said as I picked up one of the little girls. Lucilla Alexis Grossman – born December 10th 2012 – home to her new house and her mommy and daddy…. CONGRATULATIONS lovely Hilary and Marc! Awwwww! Now don’t you worry! Angel Alex will look after his little sisfur and will protect and guide her forever and ever! How adorable!! Hope the other kitties find beautiful homes too! We send mama kitty lots of purrs and hugs! Old Kitty – thanks! I know alex is already watching over Lucy and giving her pointers. So many things she has done remind us of him. 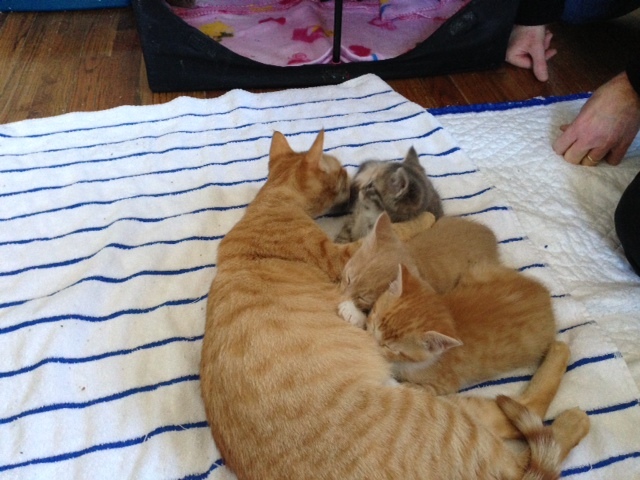 I feel bad for the momma cat – but I am sure all her babies found wonderful homes…. Oh Hilary and Marc the happy tears are just flowing here. I am so happy for you. Also, I am totally in love with Lucy. Good heavens she is sooooooooooo cute. What a lucky kitty she is to have found you two. Good job Alex getting them a new kitten. Now Alex, you need to help train Lucy. I am so excited that Lucy came home with you. Oh goody,we get to watch her grow up. Take care and have tons of fun with Lucy. Marg – I knew you would be happy! We are in love with Lucy too and I know that Alex is responsible for us finding each other… She is a really smart little girl! Catachresis – Thanks for stopping by… you are right… she is already loved and cherished! So cute. Can’t wait to get my hands on her. Hope she gives us as much love & happiness as Alex did. Loretta – she is going to love her grandma! oh how cute, have you put her down yet. How adoable. Pam – barely – she is one sweetie! Welcome to darling, precious, sweet baby Lucy! We’re thrilled for you! Big hugs and kitty kisses. Congratulations! She is so cute! Cecilia – thanks so much.. she is a doll! Welcome Lucy – you are so lucky to have such lovely pawrents. If you need any help when you start to train them do ask our Lucy as she is a tabby too and has trained our Mum to purrfection. Welcome to your new home little Lucy. You are going to have such a wonderful life, filled with love, fun and er, more fun and love! OMC we’ve got happy tears too!!! 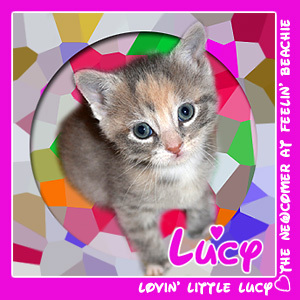 Welcome to the Cat Blogosphere Lucy! We know you’re going to have a wonderful life with your new family. We’re sure Alex sent you to them!! We just knew the recovery room was going to be turning into a kitty play room. We are so pleased to meet Lucy. And we LOVES her middle name. We know she is just a youngster, but if she is up to it send her by to visit our clown tent. We promise to keep an eye on her and keep her safe. AWwwwwwwwwwwwww. So adorable. Welcome to your new and wonderful life Lucy! We came to elcome Lucy to your home and to the Tabby Cat CLub! What a sweetie. Surely Alex helped t bring her to you. Simba – Lucy is thrilled to be part of the Tabby Cat Club! And I agree – Alex is sure responsible for her finding her forever home! Wondering if Lucy already joined the Tabby Cat Club? She’s eligible, if she hasn’t. I am SO over the moon excited for you guys!!!! Congrats!!! She is going to bring you guys so much joy and you need some joy after the year you have had!!! Welcome Lucy from Buddy and Holly, too!!!! Hugs!!! Beth Ann – thank you so much… we do need the joy and she already has brought it! She’s adorable! Welcome, Lucy. You probably are figuring this out already, but you have hit the kitten forever home jackpot with your new family! I love Lucy, we all love Lucy!!! Welcome home sweet girl! I know Alex put his paw on your heart to show you the way home. We just can’t quit looking at the beautiful you!!! Brian – I know you are right… Alex led us to Lucy and we love lucy too! Father tom – thank you so much… I bet I grow up quick! XOXO lucy! OoH dis is such wunderful news, what a cutie patootie! Little Lucy is a very lucky kitteh cuz her has found da bestest furever home fur sure! We can’t wait to gets to know her better. maggie mae and max – thanks so much… she is a cutie patootie and we already love her lots… I think she is starting to realize she found herself a great forever home! And Lucy has the most adoring eyes! What a heartwarming story! Welcome to your new home, little Lucy! laila & Minchie – thanks so much… I think everything worked out just the way it was meant to…. Ginger – thanks! Sending hugs back! Squeeeee…..Lucy popped up on my FB this morning. She looks just like my beloved MinniePie, down to her orange markings. I am just to delighted for you and Marc. Welcoming a new life into your lives is wonderful. She looks sweet, but I bet there is a bit of devilment in there….the orange sneaking into that pretty gray fur tells me so. Congrats! No house should be without a kittykat. Connie – oh I think you are right… Caren thinks it is because she is a sagittarius 🙂 but she is a sweet girl but I can see her being a little devilish – sort of like her older brother… and you are right.. no home should be without a kitty and our house once again feels like a home! Hillary what a beautiful story of Lucy’s gotcha day. The best things happen when you LESST expect them. Lucy! Very cute name and cute kitten. Glad she found a forever happy home. Jenn – thank you so much! we are thankful she is letting us be her parents! Soooooooooooooooooooooooooooo ecstatic with this wonderful news and can’t stop crying!!!!!!!!!!! What a precious precious little one! Ohhhh Lucy is going to be a handful! A Sagittarius kitty! She is going to be fearless, full of personality, athletic and a real PEOPLE cat!!! Sagittarius is my rising sign……..she is going to be a regular clown, they are sooooooo fun-loving!! Wishing the best kitty parents in the world a zillion years of happiness! 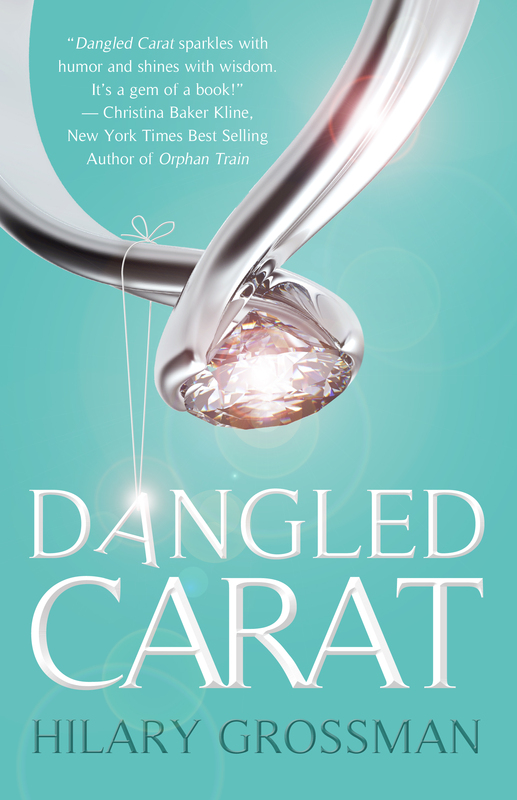 Caren – Tell Cody it’s a done deal… Lucy takes after her mommy and likes the older men – but just have him wait until she is a little older 🙂 It is funny, she already seems to be living up to the Sagittarius traits! She has already mastered the stairs! She’s adorable—and you told the story so beautifully! Happy weekend! Congratulations! She sure is precious. Arlene – thanks – and she is just as sweet as she looks! CONGRATULATIONS on the new baby! Welcome to Blogville, Lucy! Hilary and Marc — congratulations on your new baby. We are thrilled and so, so happy for you! Big hugs, and much love to you all. Meowmeowmans – Thanks guys! you are so right… Alex is watching all of us and smiling… We are all so happy – big paw hugs! Susi – Lucy is just as sweet as she looks – middle would go crazy!!! Tx, cat in NY – thanks! she really did adopt us – and she so has us wrapped around her paw already! She is adorable. I’m no cat lover, but kittens have the magic. Be happy together. You have us a bit teary, we’re so happy for you being ready to reach out to home another kitty. Welcome, Lucy. You’ll be happy in your new home. So glad for you that he came along…and that you got Lucy! She’s cute! She is such a cutie !!! Oh, she’s precious!! A kitten makes everything better. And of course Alex would want you to have more kitty love in your life. So happy for you! So very happy for you! Welcome Home Lucy! I am sitting here with a big smile on my face and eyes filled with tears. (Happy Tears) I know it is never easy to move on after losing a beloved pet but it sounds like it was time for both of you. ((HUGS)) Lucy is adorable! Debby – thanks… It is such a hard decision to make – you feel sad and guilty.. but now that Lucy’s is home we know we made the right choice. It feels so right! Lucy is adorable!!! She looks like a ‘diluted’ blue calico kitty…which is what I have. Enjoy your new friend and know that Alex is overhead somewhere smiling happily! Loy – thanks so much… I know that Alex is purring and smiling at us…. Welcome wonderful Lucy to Blogville. I know you’ve found a wonderful forever home! So happy for Lucy! Congrats Marc and Hilary! And YAY Lucy for your Forever Home! Mo – thanks we are over the moon with happiness too! She is so kyoooot!!! What a precious baby! We are so glad that she found a forever home! Welcome, Lucy! BTW, I just want to say that the conversation between you and your husband sounded JUST like some of the ones I hear here between my human and her boyfriend. Sparkle – So glad marc and I aren’t the only ones with chats like this! Welcome home Lucy! The telling of your journey to Lucy made me cry with happiness and I am not a crier at all. That is true love for each other and for Alex. Thank you for sharing. Oh, we love LUCY!! We are looking forward to becoming furrends. patty & Bhu – Yeah! I am so excited to have so many new friends! XOXO lucy! Hey, Lucy kitteh, and welcome to your furrrever home. Enjoy yourself, you little cutie. Somewhere, Alex is smiling, and probably whispering hints into Lucy’s ear. I am soooooooooo happy for you guys. Inner chick – I keep crying too… we love lucy! Welcome to you Lucy, you pretty little girl. We are so happy that you have such a loving Forever Home, and we are happy for you Hilary and Marc for letting this precious little girl into your hearts. Eric and Flynn – thanks guys! Marc and I are over the moon – we are so happy we opened our hearts because she fits right in! Hello Miss Lucy! First of all my mom says you are “ultra squee-licious”. We think you are a very lucky little girl, and Dexter wants to know when you are going to join the Tabby Cat Club? Welcome! And you did ! Welcome Miss Lucy, you will love all the fun we have! I lost my bird, Sam, two years ago tomorrow. As much as I want a new pet, I know I’m still not ready. Reading your story gives me hope that I will be, eventually. Norma – I am so sorry for your loss… You can’t push it… you will know when you are ready, just as I knew when we were…. And if you aren’t, that is okay too…. Welcome to your wonderful new home cutie pie!!! I can so feel that Alex would have wanted this for you. All of us here at the manxhouse are so happy for you and little sweet Lucy. Welcome to the innernets Lucy! Abby – thanks so much. I agree. Alex would want this and he is smiling down at his little sister…..
OMC! Lucy is beyond adorable! Congratulations! We know Alex would approve!! Wally – I am sure that your sister is as happy as Lucy is… I love that you still remember her. I wonder if Lucy will remember her family? Connie – it wasn’t easy to leave the others behind, but…. Happiness is one more piece to your life’s love story! Karen – Love this comment – and happiness is happening all around us! This is SO wonderful…I have tears in my eyes. Welcome home sweet Lucy! May you have a beautiful life filled with love and play and joy and snuggles. Oh my goodness! What a touching story!!! This sounds so much like a conversation I have had!! Welcome little Lucy!!! Congratulations on your new little one!! Very adorable little Lucy. She is so cute. Such a beautiful story and such an adorable little kitten. It will be fun to watch Lucy growing up. I am so happy for you! Pawsome story. Welcome Lucy cutey. Have a super Sunday. Hi there! I’m new here, and I just wanted to say hi and congrats for the new little one! Hi Lucy! Welcome to your forever home! Aww, how adorable. Congrats on your new addition. my eyes were tearing up reading about Lucy. Alex would be so proud of both of you. Lucy is beautiful. Of course I am a bit partial to calico’s since I had 2 very beautiful and loving calico girls of my own. i can’t wait to see and hear all of her antics as she grows. Moms busy – sorry for the tears, but I tear up too when I think back to that day… I love the calico look – I can’t stop staring at her fur – it is just so pretty! Oh that is so wonderful Hilary! Congratulations on sweet Lucy, she is just precious! Welcome home Lucy! Clooney – thanks so much – she is precious – looks and personality and we already love her lots! This is so sweet! It’s a relationship made in Heaven. Maggie – it sure is… Both Marc, Lucy and I are in heaven – we are all so happy! Oh Hilary!! Lucy is beautiful!! We are so glad for you and Marc!! We are sure Alex is dancing a jig right now!! Oh my CAT! Mommy’s BAWLING!! That’s exactly what happened when she went to see Maxwell. She just stood there and held him. And cried. She still missed Ryker so terribly much. But Maxie needed her. And more importantly, he knew something she didn’t: she needed Maxie, too. Welcoming purrs to beautiful miss Lucy! Maxie – yeah, sounds exactly alike – before we got lucy I went to the pet store when the humane society keeps the older cats looking for homes. There was one that looked just like Alex. I held him and cried and knew that I had to help another friend… And just like your mom, Marc now knows he and I needed Lucy just as much as she needed us! That sounds kind of like my story when my Mum and WB found me and my brothers and sisters at the shelter. WB was just taking her to look at the kittens and guess who they came home with. Lil ol’ Me. They are my best furrends furrever, just like you will be to Lucy. She’s a kyoot one. Welcome to the Tabby Cat Club. William – What a happy story! I wonder if WB had the same ulterior motive as me? Aaaah! She is so sweet. Welcome to the Tabby Cat Club too, I have a feeling she’s the youngest member there’s been so far. Kizzie – She is so excited to be part! We’re a little late reading about Lucy, but her Gotcha story brought tears to Mom Paula’s eyes! Such a happy story. Awwww…..she’s cute!! Do you already have her? no wait, I guess she’d be too young yet. can’t wait to read all about her adventures at the beach! Lucy – thanks so much… she is just as sweet as she looks! It has been so long since I have visited blogs but I was reading FB this morning and your page was on my newsfeed! I was so excited to read this wonderful news and see the picture of your new little furbaby! Congratulations! Cute! Looks like you’re in for a whole lotta perfect moments. Sure do love cats 🙂 One of my favorite cats from childhood looked just like the mom in this one. Enjoy Lucy!! Addison – really ? wow! I love orange cats! Lucy is a cutie!!! What a wonderful story and beautiful moment. So happy for you! Amy – thanks so much! She is a sweetie pie! Kathy – thanks! She is such a sweetie and I am so glad I didn’t have to work too hard on Marc… he is over the moon happy with his little girl! l love Lucy…l’m crying as l read this…two years ago, my cat, Jackie, passed away while l was in the hospital…my mom and dad had been going over to feed him every day, but they found him dead. lt took me awhile to decide to get another cat. Last year, l was looking at the Purina cat adoption website and found a kitten named Jay [same name as the hero of my first ebook]. He was the last of six kittens to be adopted and as soon as l saw him, l fell in love [so did my friend who drove me out to see him]. l’ve had him since 11/11/12, and he is a sweetie. Nancy – I am sorry for bringing the tears and do sorry about your cat. I can’t imagine how hard it was to lose him when you were in the hospital and not able to have been with him… It is amazing how you, like us, didn’t know if we would ever be ready, but then fell instantly in love. When I saw Lucy’s picture on Facebook I knew we had to make her part of the family. I was crazed! Now I can’t imagine her not in our lives… Sending big hugs! So happy for you! I am just catching up now. What a wonderful post! Now your house is a home [because Lucy is there]. Cattywumpus – you are so right… Lucy did make our house a home. I can’t believe she is with us for almost a year! Lucy is so cute. I’m glad you shared the conversation. Have a good time in Florida.